The charm of archetypes, re-interpreted in neo-decò key. A stylist solution that confers character to the entire environment. 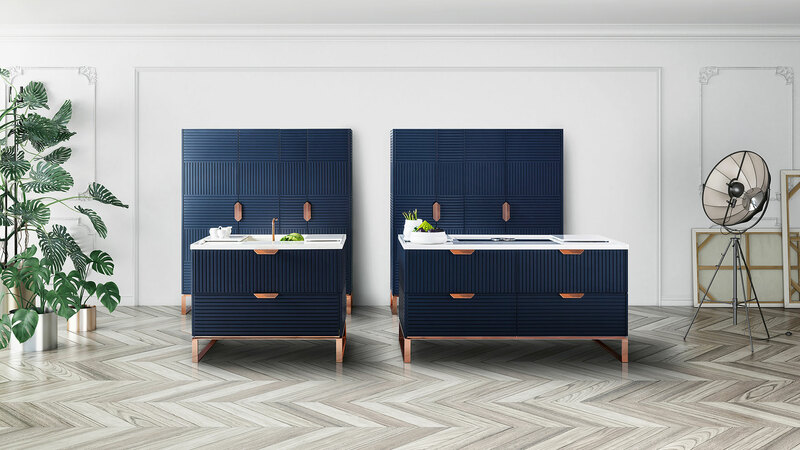 The Miuccia kitchen is shrouded in the mystery of midnight blue, the preciousness of rose copper and the solidity of Pirgon stone — all skilfully combined in a neo-déco interpretation of contemporary space. A linear composition of strong personality. Doors with 3D decor, velvet finish that combines pleasant touch to chromatic depth, sober sought-for combinations with natural stone and rose copper. Our classic culture, Italian know-how and international style co-habit in Miuccia. Miuccia pays tribute to craftsmanship from Marche and excellence in leather, copper, stone and wood workmanship. 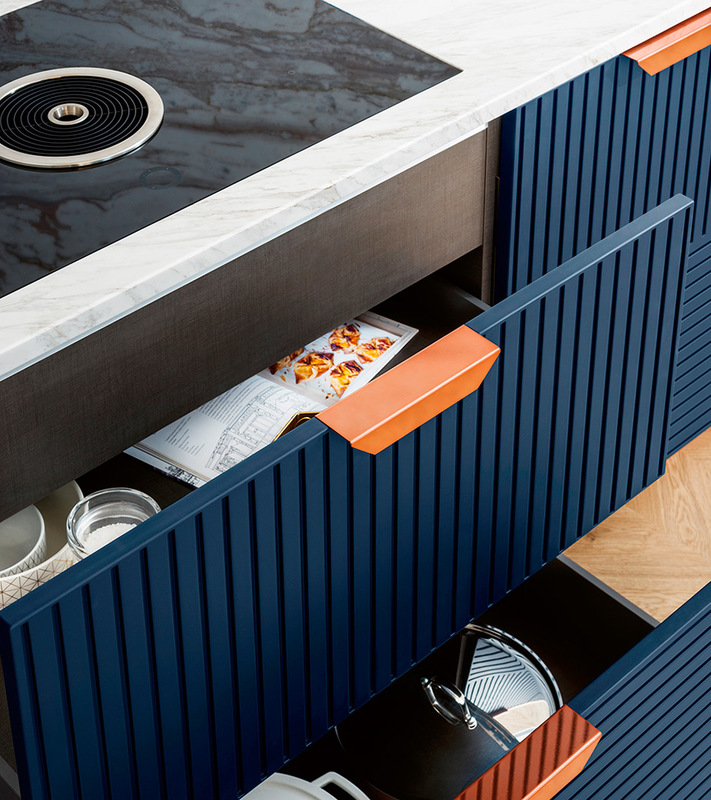 In this linear composition, the rhythm paced by the decorative motif wisely alternated between doors and fronts is interrupted by Volakas stone that frames the work area featuring induction hob with built-in hood, assembled stone sink, dishwasher, drawers and bins. The lateral columns leave space to the double ovens, the food warming drawer, refrigerator, freezer and large pantry compartments. 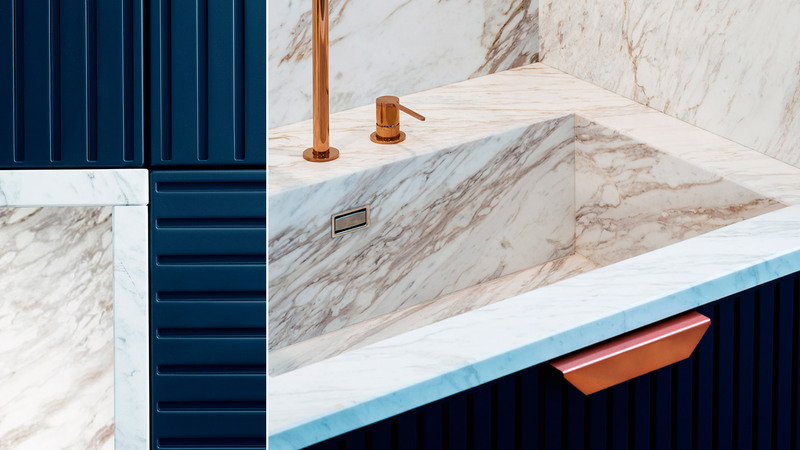 The doors are characterised by blu velluto finish, rame rosa handles, matched to the base and faucets. 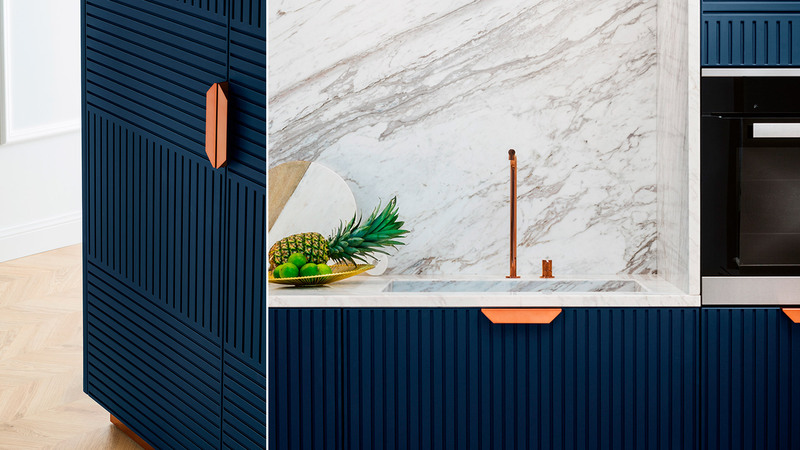 All wall units feature push-and-pull opening. The work area is lit with built-in spotlights. The formal precision of the Miuccia enables it to be sophisticatedly combined with the areas adjoining the kitchen, allowing the customer to supplement the compartments or apply Miuccia to an open space with a distinct style. In the catalog there are two linear composition variants, with different positioning of the ovens and simplification of the stone frame of the central work area. 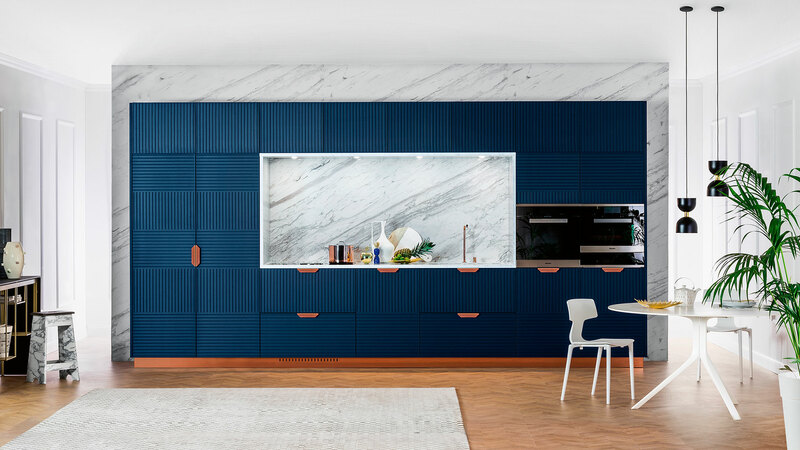 In the first version, it leaves space to higher wall units that increase the pantry area and create a tree-dimensional composition with a different depth in relation to the columns. The stone back can be lit with continuous led lights or built-in spotlights. A composition with double islands, independent columns and asymmetric doors. The columns can be equipped with exclusive metal details matching the handles: glass holders, hinge covers, crystal shelf supports. The islands are instead equipped with special sliding chopping boards in stone that conceal the induction hob and sink. Solution with double island and double independent cabinets, or with single island and columns, proposed with nero texturizzato lacquered finish, Brown Emperador stone top, metal details in bronzo anticato. The structures can be raised from the ground through optional metal slides. The metal details are available with acciaio lucido, rame rosa, bronzo antico finishes. Miuccia is also one of the TM Italia Cucine’s modular systems. 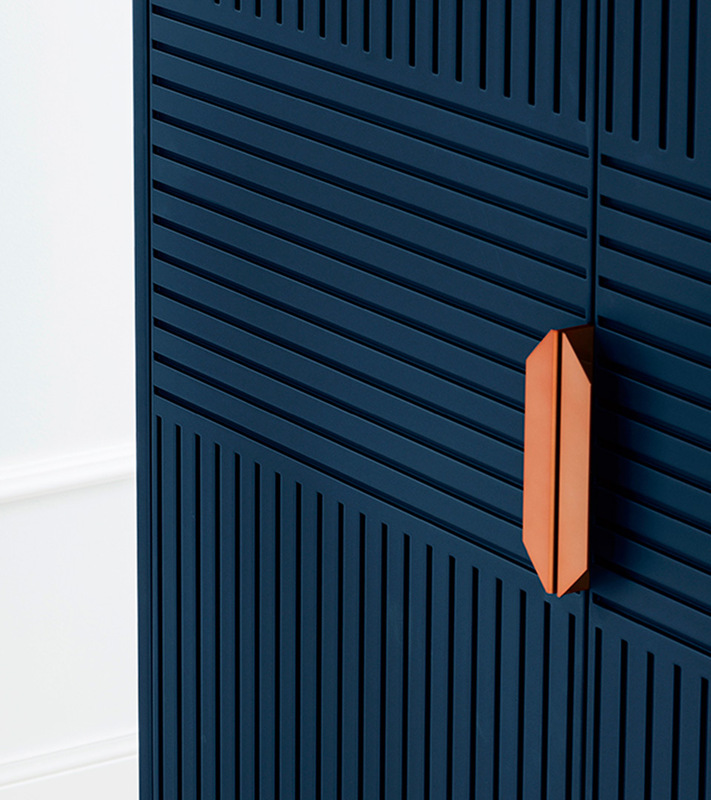 Doors and fronts present the original tridimensional manufacturing with alternate decorative modules applicable to all the lacquered finishes in the catalogue. 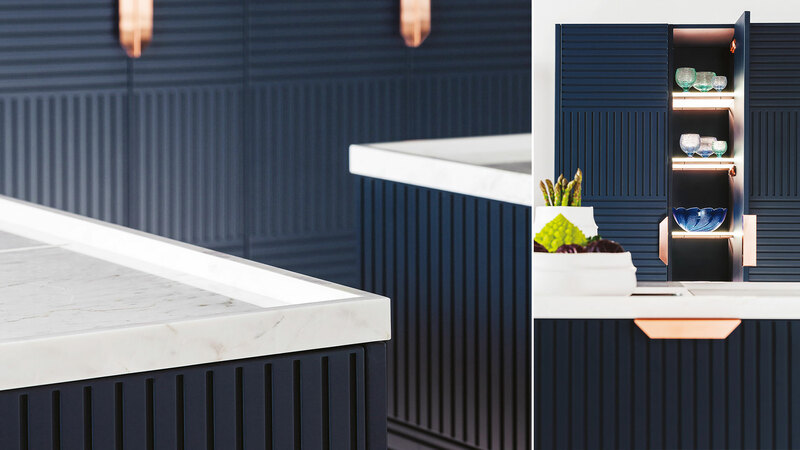 The Miuccia concept is available in 6 combination of materials for doors and fronts, worktops, handles, bases and plinths.